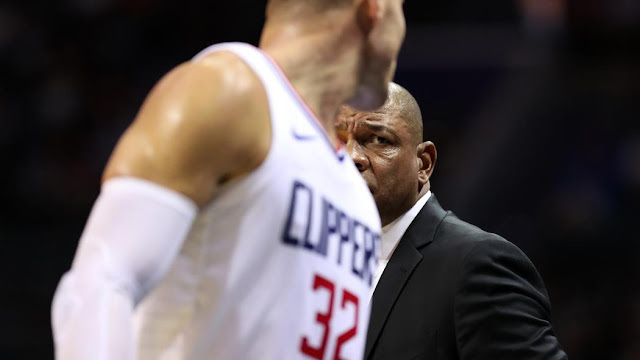 Clippers are bad - is Doc Rivers' job on the line? Chris Paul is in Texas. DeAndre Jordan is an unrestricted free agent whose name will swirl in rumors until he’s either dealt or the trade deadline passes. Doc Rivers was demoted from his President of Basketball Operations duty a few months ago, and entered the season with Las Vegas believing he was likely to soon lose his head coach job as well. The harsh reality of NBA life with one, and not two, top-20 players battling on your behalf has officially smacked Griffin and the Clippers in the face. Not all of the blame can be placed on Coach Doc Rivers. The injuries have taken a toll, and Doc was forced to deal with previous owner, Donald Sterling, who was finally ousted from the NBA by Adam Silver for racially-insensitive remarks.That had to be a rough road for Doc. But it may be time for Rivers to move on. Jerry West is now in the Clippers front office as a Consultant, and Jerry has a history of turning NBA teams around in a positive way. He did it with the Shaquille O'Neal/Kobe Bryant Lakers and the current Golden State Warriors team. West is not afraid to clean house. Doc Rivers coached for four seasons in Orlando before being fired early in his fifth season there. He coached for nine seasons in Boston, winning one championship in 2008, before heading to supposed-greener pastures on the West Coast. He is in his fifth season with the Clippers, and it may be time for him and the team to part ways. Owner Steve Ballmer has a lot of money, and he has Jerry West to assist with decisions on the future of the team. But Doc may not be in the Clippers' future plans. The grass in those imagined greener pastures has turned brown.